I just finished testing and photographing the all-new 2011 Scion tC sports coupe painted in the new ‘Cement’ color and had to laugh when I first looked at the Scion tag with the key and read that the color was the new ‘Cement’. The all-new Scion tC sure is no bucket of cement although the light gray or silver color does look like newly laid cement on a sidewalk. The all-new 2.5 liter inline four-cylinder offers the latest in efficient, lightweight technology built using an aluminum block and head. 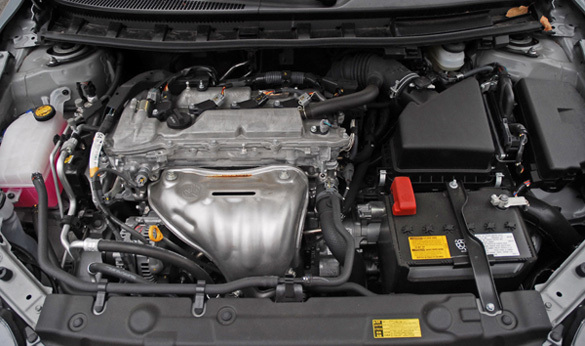 The engine also features dual variable valve timing with intelligence (VVT-i), roller rocker arms and a variable-induction manifold system that changes the length of the air-intake pipe to supply more torque on demand. I felt that extra torque push even when I was in sixth gear driving up an incline at 65mph. The new engine produces 180hp at 6,000rpm, 19hp more than last year’s model, and 173lb.ft. of torque 4,100rpm. Performance is further improved through a new intake-manifold design and a sport-tuned lightweight exhaust system that delivers a noticeably bolder and more aggressive exhaust sound. The all-new tC is offered with the choice of two all-new six-speed transmissions, each adding driving excitement and excellent fuel economy. The manual transmission features smooth, short, confident shifts that are direct and precise. The automatic is optional and boasts sequential shifting, providing an additional fun-to-drive element. 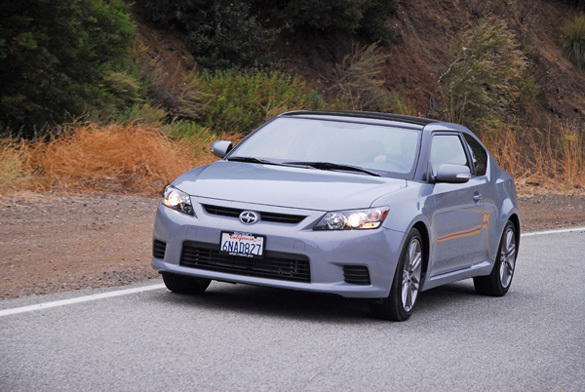 As a result the 2011 tC has quicker acceleration, 6.5 seconds with the manual, and an increase in fuel economy, 23mpg/city, 31mpg/highway, over the previous tC model. The all-new tC also adds electronic power-steering that contributes to increased fuel efficiency with its lighter weight. It gives an outstanding feel for the road with a great on-center feel as well. 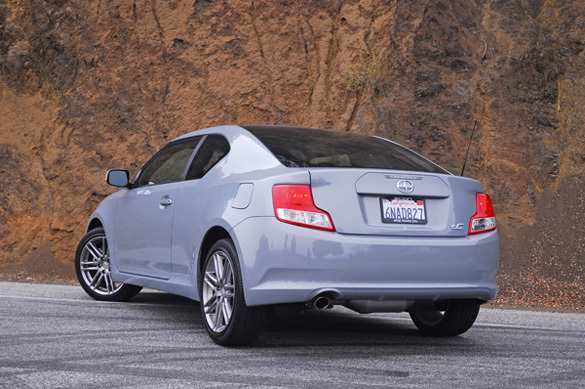 The 2011 tC enters its second-generation riding on an enhanced, stiffer platform. The new suspension features a MacPherson strut front, and double-wishbone rear setup that were specially tuned to offer both a sporty ride that is both nimble and confident. It proved it to me as many times during spirited driving in the mountains I felt that the tC was a rear-wheel drive coupe because it is so well balanced when challenging steep curving roads. I felt only a little understeer when cornering at high speeds. Part of the reason for the ‘riding on rails’ feeling is due to the fact that the new tC rides on wider 18X8 inch alloy wheels wrapped with wider 225/45R18 inch high-performance tires that also give it a broader stance. Further adding to the enhanced handling ability of the new tC is the standard vehicle stability control and traction control systems that can be shut off with the push of a button to let the car slide a little when cornering. The new tC also comes standard with larger, power-assisted four-wheel disc brakes, 12 inch vented discs up front, clamped with dual-piston calipers, and 11.2 inch solid discs in the rear, clamped with single-piston calipers. Enhancing your control during heavy braking maneuvers are standard ABS, EBD and BA. 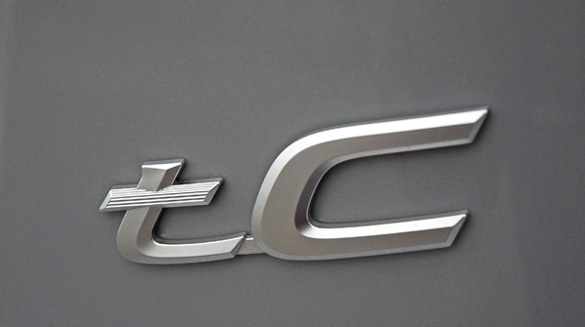 The tC’s all-new design projects a bolder, more aggressive stance. It is inspired by the Calty-designed Scion FUSE concept, the tC is a high-impact sports coupe with simple and unique elements. Calty designers took inspiration from the athletic look of a racing helmet. As a result, one of the boldest design features of the new tC is the sleek cabin shape of wrap-around windows graphics with an arrowhead shape that adds to its sporty style and gives it a look of motion when parked. Adding to the fresh design approach is a strong, renegade fascia. The sleek front grille and projector headlamps are complemented by protruding fender flares, which amplify its wider, lower stance. The front interlocks with the dynamic, muscular rear fenders. The shape of the rear taillights flow cleanly into the overall shape of the hatch, finalizing the iconic and purposeful nature of the total design. A single, 3 inch wide exhaust tip is cut out from under the left side of the rear bumper next to the diffuser. The tC can be wrapped in an urban palette of seven colors-super white, silver streak mica, black, magnetic gray metallic, sizzling crimson mica, nautical blue metallic, and the all-new cement. The sporty design of the new tC carries over to the interior with a look and feel that is sophisticated, sporty and functional. The front cabin design provides a driver-centered cockpit that is canted toward the driver with plenty of room for easy movement for the front passenger. The beefy, tilt-telescopic steering wheel is leather wrapped and feels perfect in your hands. The flat bottom of the wheel provides additional thigh room making it even easier when turning the wheel. 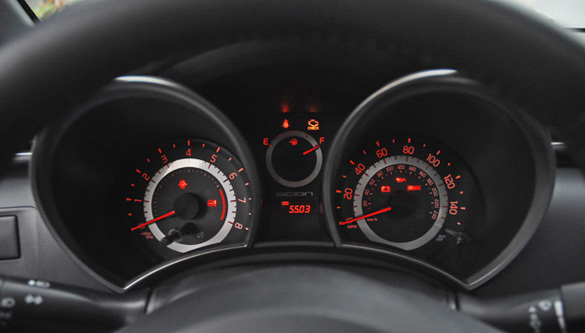 Dual illuminated combination gauges for the speedometer and tachometer have a three-dimensional appearance with large meter and needle indicators for good visibility. The middle trip meter also includes readouts for outside temperature, average mpg, and an ECO-drive indicator on automatic transmission models that helps the driver maximize the tC’s fuel efficiency. 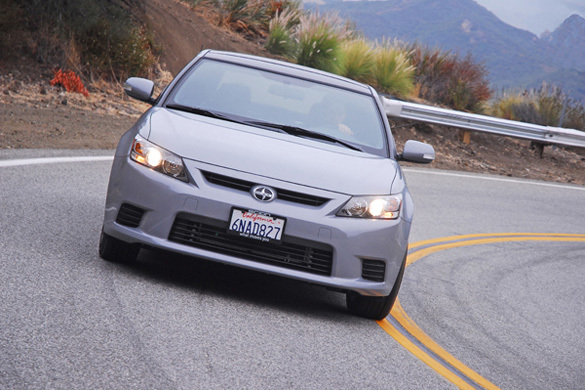 The sporty tC does not sacrifice driver and passenger comfort. As part of the redesign, engineers made significant interior upgrades in the area of driver and passenger comfort and convenience. 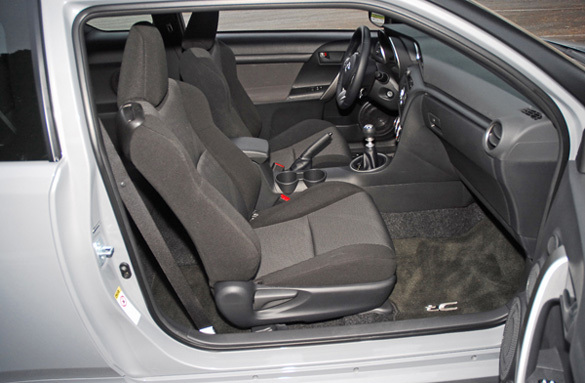 Among the many interior comfort features is a driver walk-through seat-memory function for both the seat and backrest. 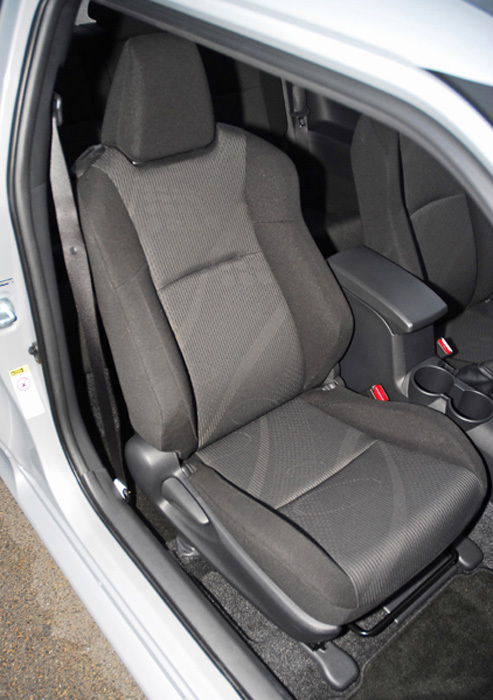 The driver and front passenger bucket seats and rear passenger seats are upholstered with premium fabric designs. Added comfort was accomplished by making the seats thicker, with firmer seat bolsters, while the driver seat is six-way adjustable. 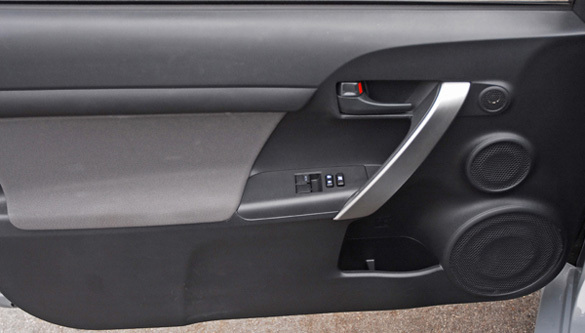 Entry and exit for rear passengers is made easy with a walk-in lever located at shoulder level on the front seats. 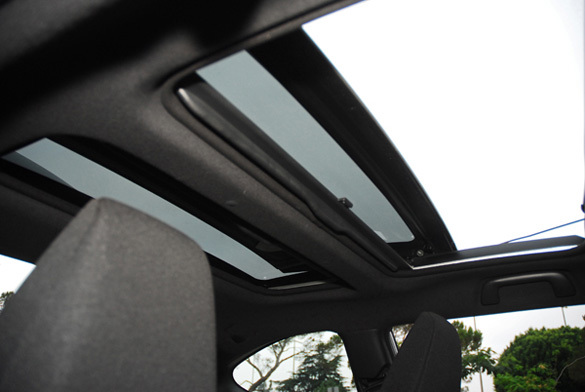 For added comfort and utility, the rear seats are 60/40 split, and recline up to 10-degrees. 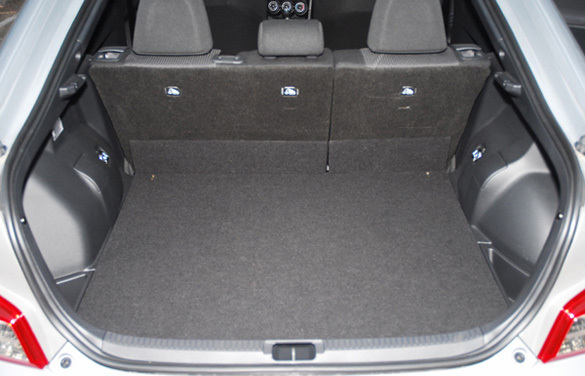 Staying true to Scion tradition, the new tC has an abundance of storage throughout. Additional driver and passenger comforts include four bottle holders, a large center console box that can hold up to 18 CD’s, two cupholders, a flat storage area in front of the console, assist grips above each door, sun visors with vanity mirrors and dual map lights. All dials, switches, buttons and levers are within easy reach. The tC features a powerful standard audio system with a total of 300-watts feeding the eight-speaker sound package. With an emphasis on amazing sound quality, the tC’s stereo system shares some speaker components from the Lexus LX570, and features mid-range and woofer speakers that are superior. The tC comes standard with a Pioneer AM-FM/CD head unit with USB and iPod connectivity. The 160-watt Pioneer head unit powers the tweeters, mid-range and full-range speakers, while a separate 140-watt, two-channel amplifier is designed to drive power to the 6X9 inch door-mounted woofers. The standard head unit integrates track, artist and album information from the iPod into a one-line display on the head unit’s screen. Connectivity is achieved by simply plugging the iPod into a port via a USB connector cable, while the car’s stereo system provides outstanding sound quality and constant power to the iPod. Music is controlled through the head unit and steering wheel audio controls. An auxiliary port is also standard, allowing users to listen to various portable music players. The optional Alpine Premium audio system has the same basic features as the Pioneer audio but adds a 4.3 inch color touch-panel thin-film transistor (TFT) screen, HD radio technology, media expander (MX) and front and rear RCA outputs. Passengers can listen to HD radio technology with the premium audio system and view text, song titles, album and artist name on the head unit. Alpine’s MX improves compressed audio sound often found on digital music. The RCA outputs allow for up to three amps-front-rear and subwoofer. The optional audio system is also navigation and back-up camera ready. Scion also offers an optional plug-in navigation unit for the Alpine Premium audio system. Navigation and audio functions utilize the head unit screen for display. Features include voice guidance, day and night screen modes, support in English, French and Spanish, 200 available address book entries, map coverage across the U.S. and Canada including Puerto Rico, the US Virgin Islands and Hawaii, three map views (3D, north up, and heading up), and more than six million points of interest. Users can also program up to three destinations before arriving at their final programmed stop. Scion makes this navigation unit customizable by allowing the user to change the vehicle position icon from an arrow to an icon of the tC, which can be customized to the seven tC exterior colors. Both the standard and premium head units retain key Scion audio system features such as Scion Sound Processing (SSP) where listeners can choose from three pre-set equalizer settings, satellite radio compatibility and MP3, AAC and WMA capability. In addition, both units adjust the volume control based on driving speed. A Scion navigation system is also available, featuring an audio/video/navigation unit with a seven-inch LCD touch screen. The system also has iPod connectivity, SSP, Alpine equalizer, Alpine Focus, which allows users to move the center of the sound field, clear sound effecter (CSE) to enhance compressed digital music data, Alpine digital sound processing (DSP), automatic volume adjust; and satellite radio capability. This audio system also features HD radio capabilities including HD Tagging, rich sound and on-screen text information, as well as Bluetooth and Bluetooth streaming audio. Standard equipment not mentioned above in the new tC includes a panoramic glass moonroof with power tilt/slide, color keyed power outside mirrors with LED turn signal indicators, intermittent front windshield wipers/washers, power windows/door locks, remote keyless entry with engine immobilizer, A/C, cruise control, multi-information display, digital clock, thick cut-pile carpeting and floor mats front and rear. 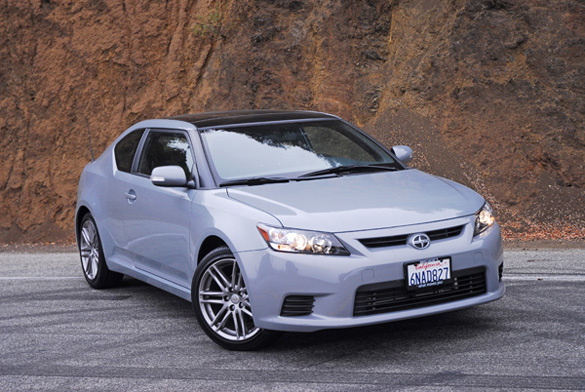 You can speak with your Scion dealer about other options and upgrades for the exterior and powertrain of the tC. Standard safety features include front airbags, side-impact airbags, front knee airbags, front and rear side curtain airbags, front active headrests, 3-point safety belts with front pretensioners/load limiters, height-adjustable front seatbelt anchors, tire pressure monitoring system, a first aid kit, and the LATCH system for child seats. 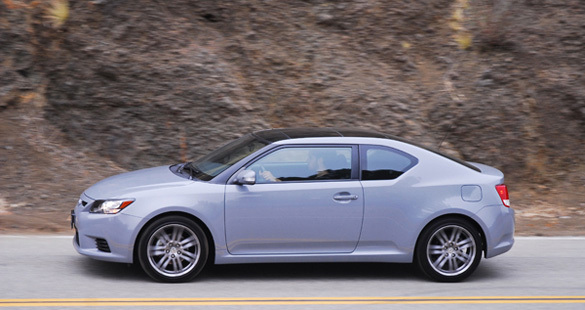 I was really impressed with the all-new 2011 Scion tC after my seven-day test drive. It has great sporty styling, a powerful engine that rockets the car at launch, a unique suspension system that handles more like a rear-wheel drive car, a sporty, comfortable and safe interior with options to enhance the fun-to-drive aspect of owning this very economical and value laden sports coupe.